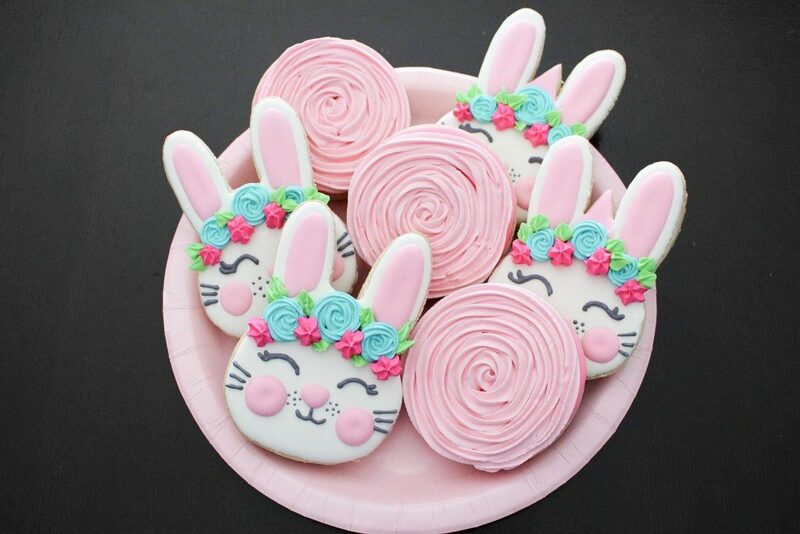 But we assure you there is no better way to shoo those chilly blues than with a homemade treat, especially treats as cute as these! Follow along with our step by step instructions below and you’ll have a sign of spring in your hand. 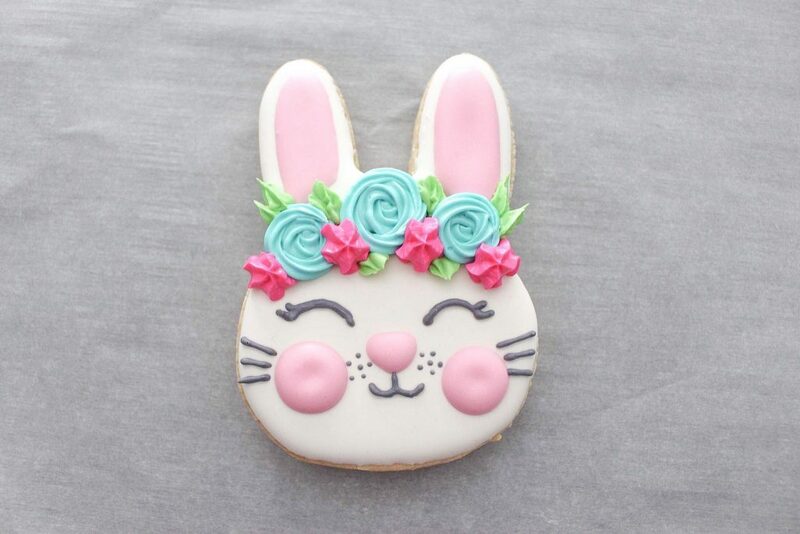 This cheeky bunny in a flower crown will be sure to bring a smile to your family and friends. 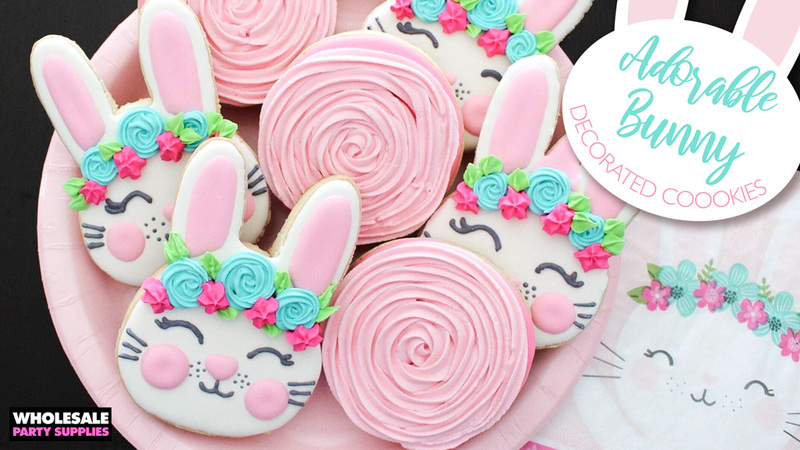 But if you have a little girl with a springtime birthday than this Birthday Bunny Party theme that inspired this cookie is worth browsing. 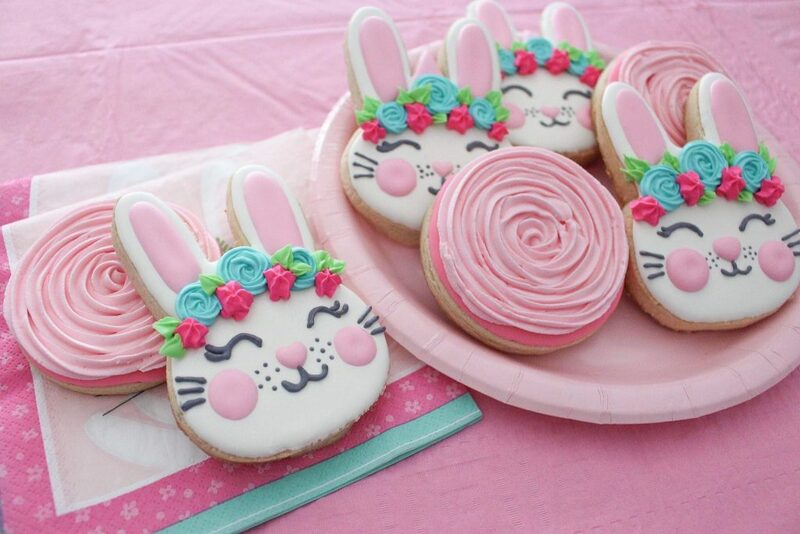 As a party favor, these cookies will make the guests say AWWW or tucked in an Easter basket, they’ll do the same. Smiles all around are guaranteed. This project was created, written and shot by Ally from @ally.bakes on Instagram where you can see more of her sweet treats! Before you get started you’ll need to bake some cookies and make the icing. Check out this post with recipes and instructions to get started. 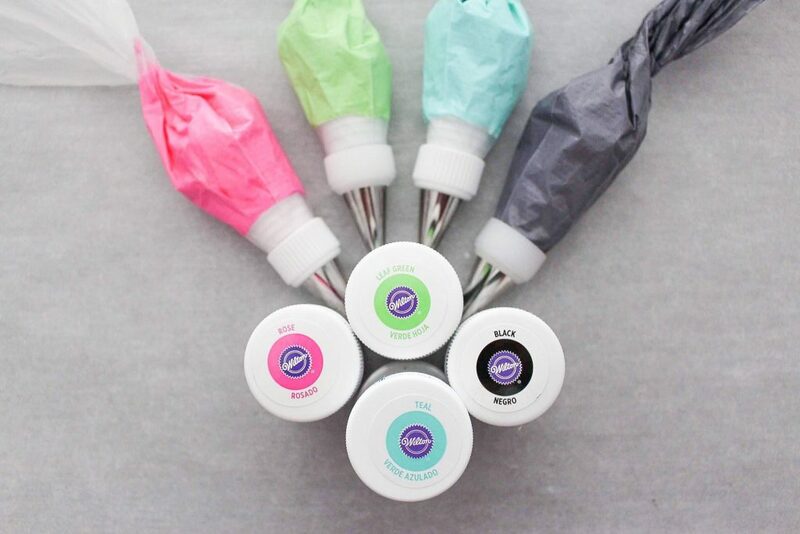 Royal Icing colors you’ll need are Pink, Rose, Green, Black, Teal, and White. 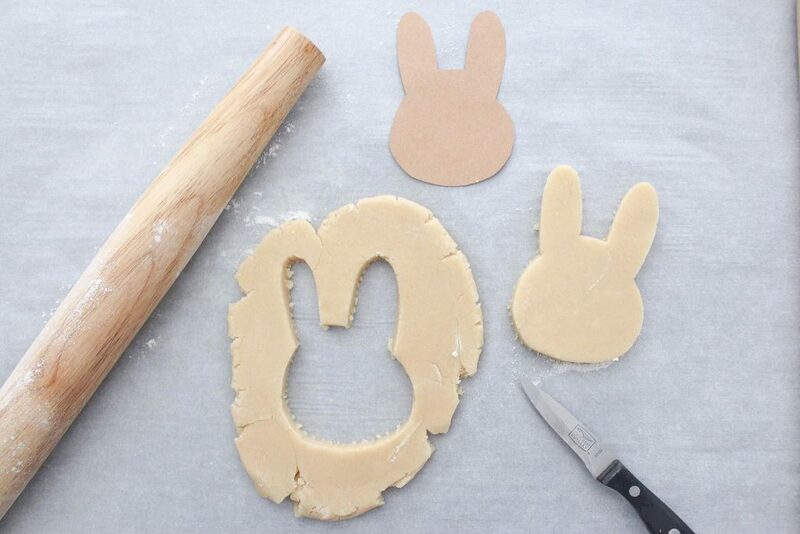 Make cookie dough, cut bunny shaped cookies, and bake! 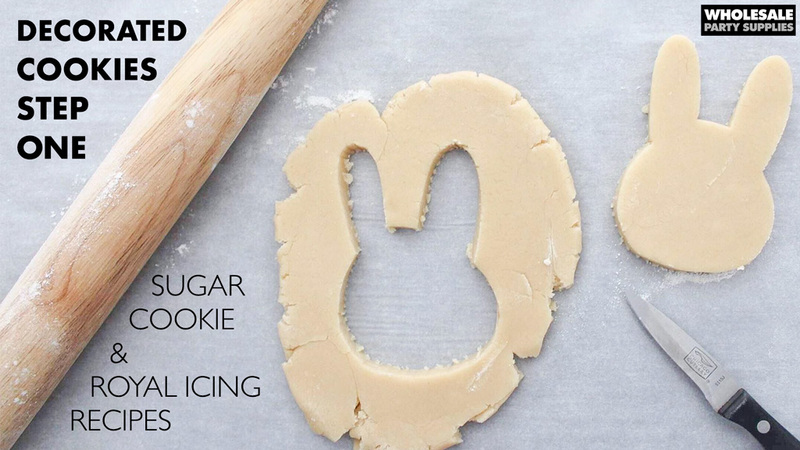 Find out how to make cookie dough here. 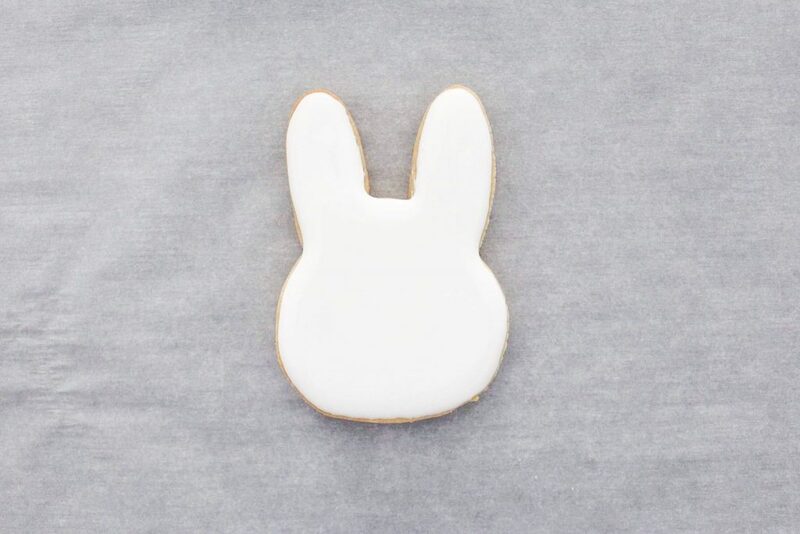 Outline and fill in the bunny cookie with white icing for the first layer using the round piping tip. 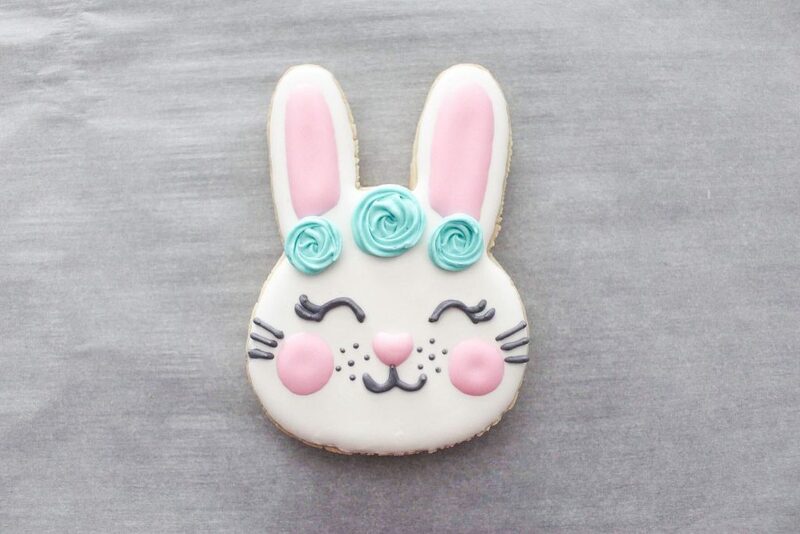 The icing should follow the consistency as described in our royal icing recipe post. 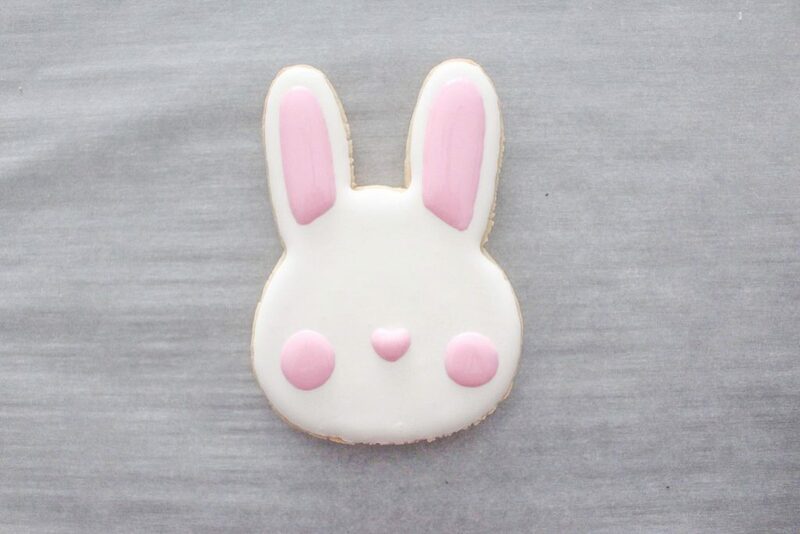 Tip: if icing is uneven or you have bubbles, use the scribe tool/toothpick and even it out. Let the icing dry completely – wait until the icing is solid. 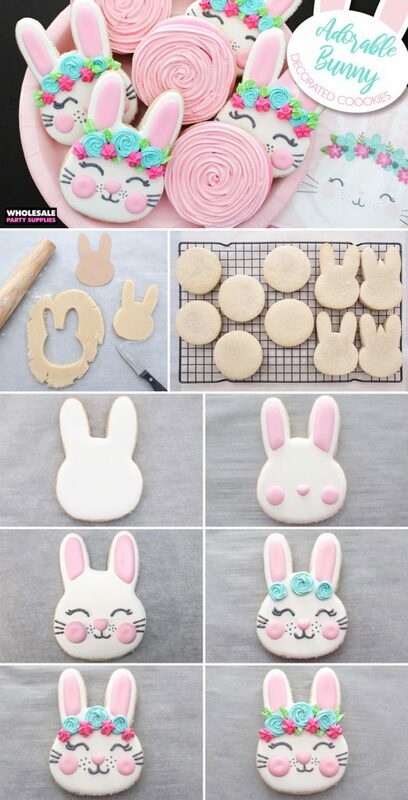 Add the pink icing for the ears, cheeks, and nose using the round piping tip. 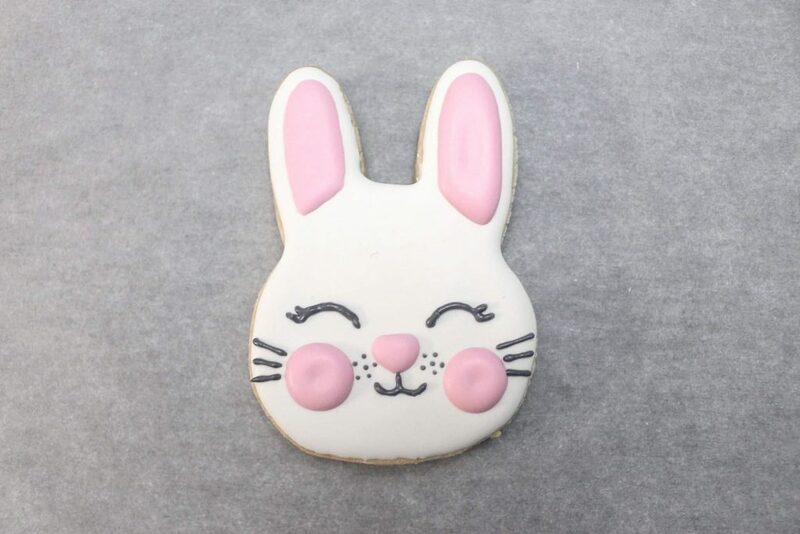 Use the black icing to add the eyes, whiskers, mouth, and freckles using a smaller round piping tip. 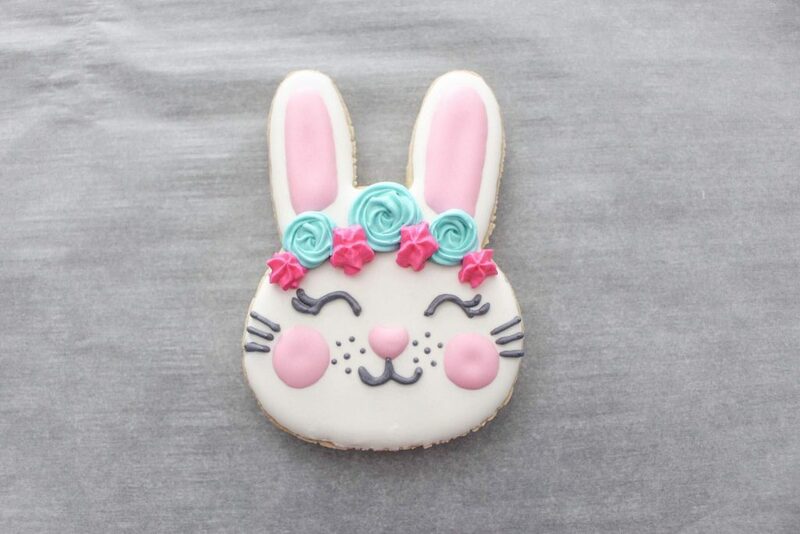 Next, you’ll want to use the thick icing since it is perfect for making flower shapes. Use the Wilton icing color for green, teal, and rose pink. Using the star tip, use teal icing to pipe blue flowers. You’ll want to start in the middle and swirl around that center. Swirl the icing one or two times depending on how big you want the flower. Next, use the rose pink icing and simply squeeze the piping bag once to have the star-shaped flower. Using the green icing and a leaf tip, add leaves to the headpiece. 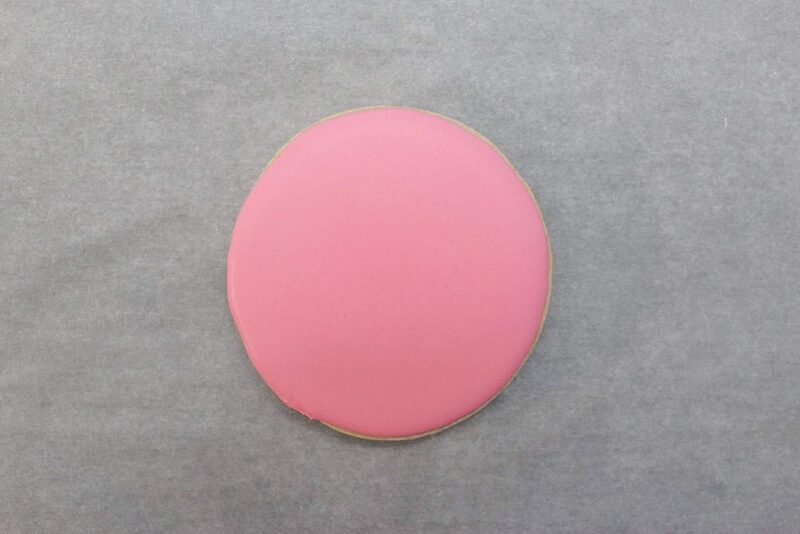 Using a baked circle shaped cookie, cover the entire cookie using pink icing. 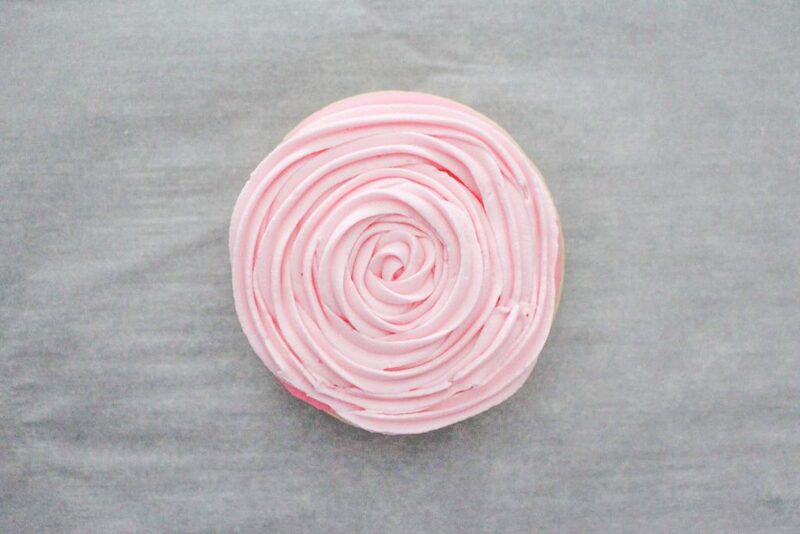 Using a star tip and thick icing, begin with icing in the middle of the cookie and swirl (making sure the icing is touching) all the way until you hit the edge of the cookie. 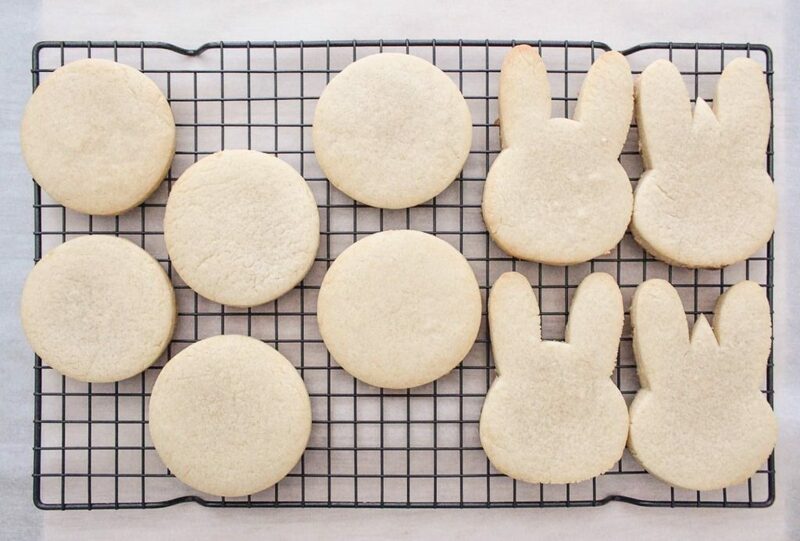 Once all of your cookies are completely dry, you can plate them or package them. 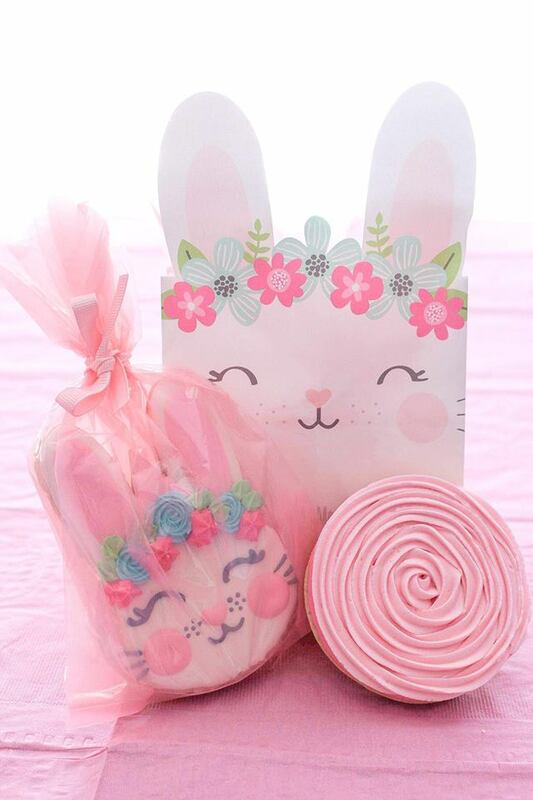 Clear cello bags let your artistic expertise show, but these adorable bunny treat bags will let the surprise hide inside.